Saturday Morning Astrophysics kicked off the semester with students creating a scale model of the recent solar eclipse, proportionally scaling the sun, Earth and moon and the distances between them. Based on a five-foot diameter sun, the Earth is about the size of your eyeball. The moon is only the size of a pearl on the head of a pin about 30 cm away. Going outside, students found that at this scale the Earth-moon system are a whopping 450 feet from the sun! 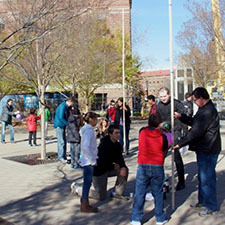 Purdue’s annual homecoming always provides opportunities for Physics and Astronomy Outreach to engage the public with fun and science. 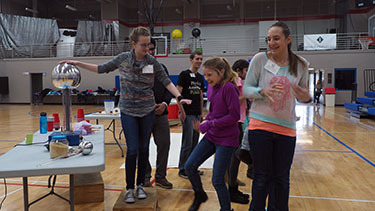 This year, The Society of Physics Students (SPS) provided ample volunteers to help youngsters and oldsters alike explore the vortex canon and lever strong enough to a sumo wrestler! Without anything but your fingers, anyone can create pinhole effects to view the eclipse simply by projecting images on the sidewalk. The inaugural Physics Inside Out summer camp engaged local middle school students with Physics and Astronomy faculty exploring their passions. A total of nine faculty worked with Outreach Coordinator Dr. David Sederberg to create a whole week’s worth of exploring, experimenting, analyzing, and creative thinking, all in the fun of science. It’s what we do! 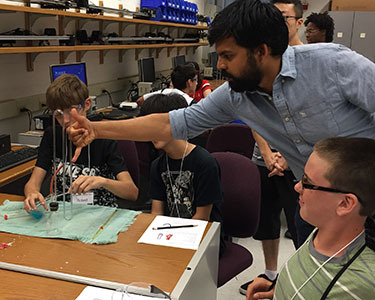 Below, Professors Rudro Biswas (left) and Tongcang Li (right) mentor students in experiments in heat and light. 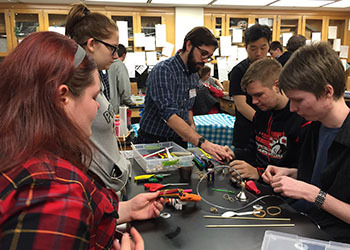 In a first of its kind program, Physics and Astronomy Outreach Coordinator David Sederberg, with Professor Lynn Bryan, led 8 Purdue undergrads on a STEM Service Learning Study Abroad. 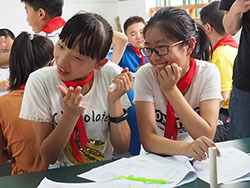 Purdue students paired off to design and teach inquiry investigations to 4th and 5th grade students at Nanjing Zhushan Primary School. 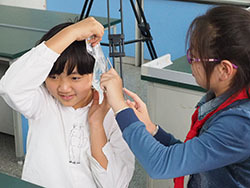 JSSNU (Jiangsu Second Normal University) in Nanjing partnered with Purdue to facilitate and coordinate the study abroad with the local elementary school. 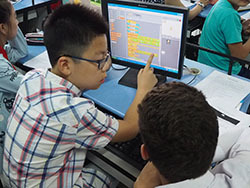 With the aid of a JSSNU undergrad translator in each class, Purdue students taught 400 Zhushan students lessons on electric circuits, sound, computer coding and security encryption, each of which culminated in a final design project. 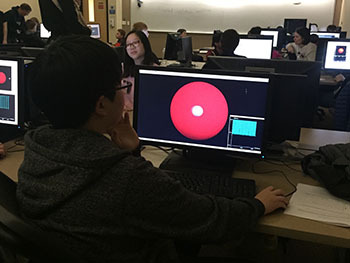 With the help of CS major Guna Kondapaneni who authored the VPython computer simulation, Purdue Physics and Astronomy Outreach hosted a class of middle school students in a session in which they learned about the research behind searching for planets beyond our own solar system. The guest lecture on the topic was presented by post doc, Avery Archer. 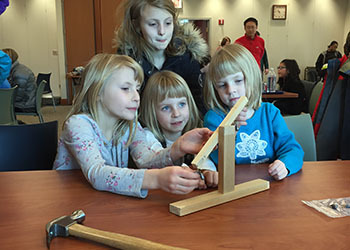 Undergrad service learning students enjoyed their Saturday presenting their interpretations of force and energy to six groups of middle school girls. The program was a part of Curiosity, Confidence and Challenge, aimed at introducing girls to career paths in STEM fields. One of the favorite exhibits was the Van de Graaff generator, a truly shocking experience! 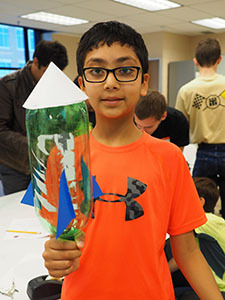 With an introduction to the history of rockets, students in Purdue's Saturday Morning Physics program were given the challenge to design and produce variations of water bottle rockets. They then put their designs to the test, comparing the effect of pressure and water on the altitude their rockets attained. Physics and Astronomy Outreach presented their Sidewalk Science program at Carmel Clay Public Library's Science and Engineering Day. Prior to opening the program, outreach service learning students trained fifteen Carmel High School students to run each of the stations for the program participants. 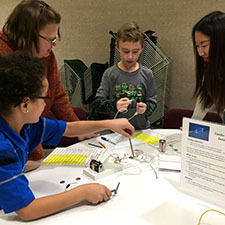 Over 300 3rd through 8th grade students and their parents learned about bending light, inertia and momentum, buoyancy, electric circuits, and other fun and engaging science concepts. 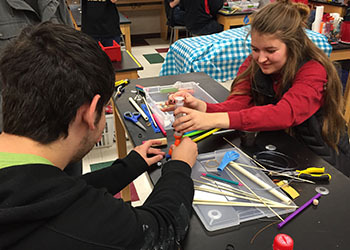 In a partnership with Professor David Ely's Engineering Design students at Ivy Tech, Physics and Astronomy Outreach engaged Jefferson High School students with the Robo Engineering Challenge. 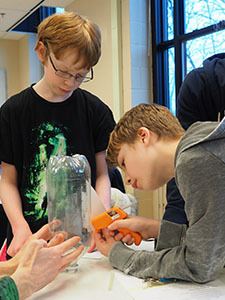 In a scenario in which contaminated items need to be retrieved mechanically and deposited in a safe container, student teams brainstormed, designed and tested apparatus of their own creation to accomplish the mission. 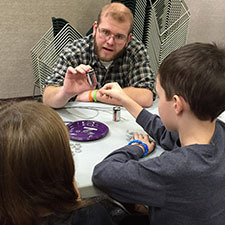 Physics and Astronomy Outreach undergrad and graduate student volunteers recently presented "Sidewalk Science" at Tippecanoe County Public Library for children from grades 3 through 8 and their parents. 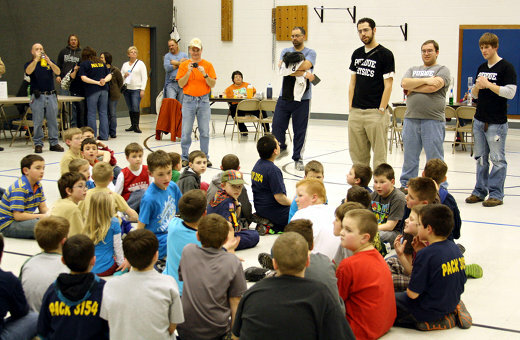 The program presented over a dozen interactive activities designed to teach fundamental principles of science. Among them were Electric Circuits, Periods of Pendulums, Density Straws, and Squiddy the Cartesian Diver. 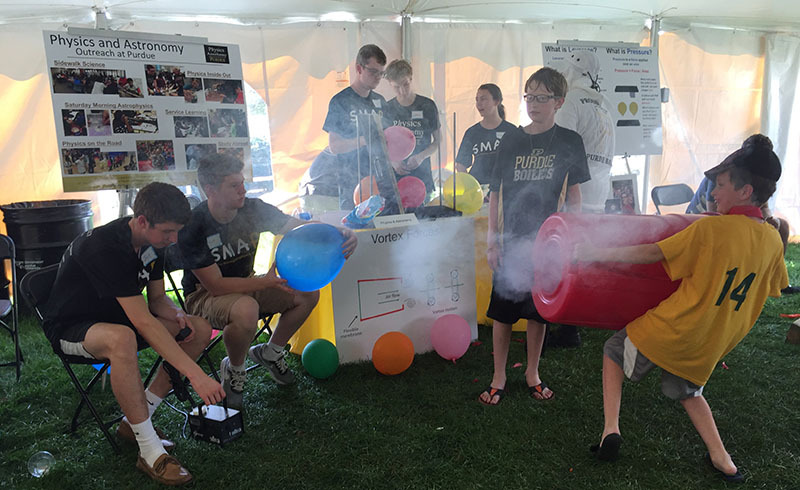 Students from the Physics and Astronomy service learning course demonstrated concepts related to vortex forces for friends and alumni at Purdue's Homecoming. 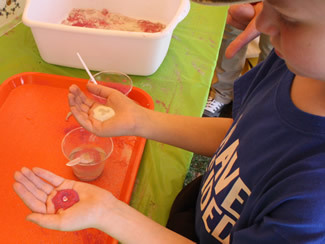 Visitors were provided a handout and materials for making their own vortex canon. SMAP is off to a stellar start this semester. 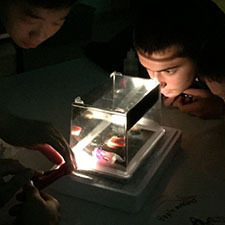 In recent classes, students assembled telescopes, used cloud chambers to observe radiation coming from outer space, and created models to explore the energies produced by exploding stars. Stay tuned for more! 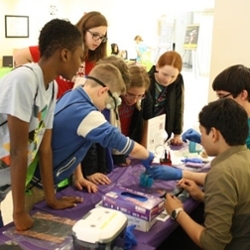 NanoDays is an annual presentation of interactive learning exhibits for upper elementary grades through high school. 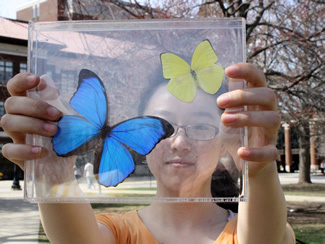 Held at the Birck nanotechnology Center, activities introduce students to material behavior in the realm of nanoscale! 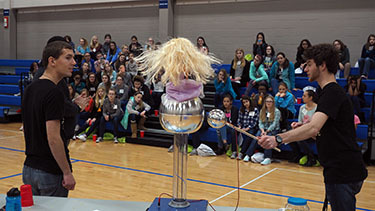 Physics and Astronomy Outreach service learning students demonstrated concepts related to force and pressure for 150 6th graders. Purdue Engineering sophomore Alex Weldy tortured popular teacher, Mr. Harmon, with the dreaded Bed of Nails. P and A Outreach engaged 450 middle school girls at Sycamore School's Curiosity, Confidence and Challenge, a conference targeting careers in science, technology, engineering and math. The girls explored phenomena related to extreme temperature, presented by Outreach Source Learning students. Feeling the crunch of lettuce quick frozen in liquid nitrogen. Learning about resistance versus temperature with human electrons. 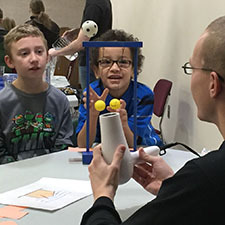 Physics and Astronomy Outreach conducted a program at the Tippecanoe Public Library in which middle school students explored the relationship of surface area to volume as a consequence of size. 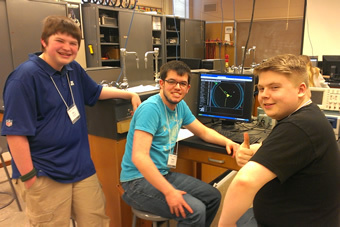 Physics Source Learning student Matthew Smith conducted the sequence of activities in Igor, the Tiny Tiny Human. 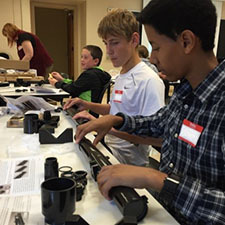 Students from nearby high schools recently spent the day with Purdue Physics and Astronomy Department faculty and outreach staff learning about high energy particle collisions by examining data from CERN. The MasterClass program is an annual event for students of teachers participating in Purdue's QuarkNet program. 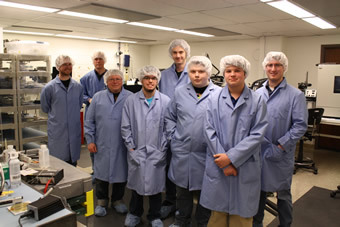 A highlight for the students and their teachers was a tour of Physics and Astronomy's micro fabrication facility. 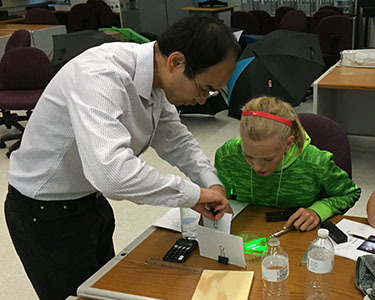 Physics and Astronomy Outreach hosted local female high school physics students as guests to the Conference for Undergraduate Women in Physics recently held on Purdue's campus. 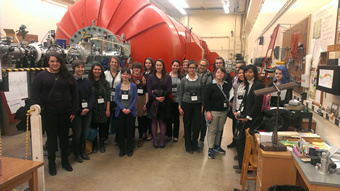 The program provided girls the opportunity to attend panel discussions, engage with role models of diverse career paths related to physics, and to tour representative research facilities. 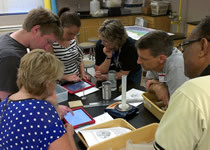 STEM teachers at Lafayette Jefferson High School participated in an intensive two-week summer program during which they designed an elaborate and creative array of instructional materials and assessments, cutting across traditional content area boundaries. A requirement was that each unit encompassed at least two disciplines. Image caption: teachers relating emission spectra to applications in astronomy. 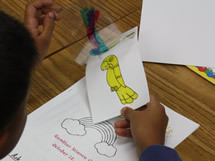 As part of their experience, the teachers piloted the materials they had designed with 50 student volunteers. 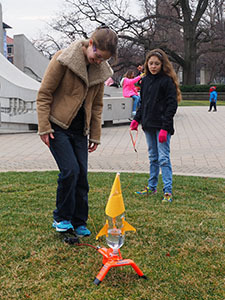 This program is one of two three-year outreach teacher professional development programs with which Physics and Astronomy Outreach is involved. 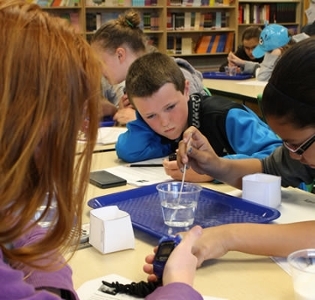 Teachers will have access to laboratory materials, probe ware and instrumentation, through Purdue’s Science Express Program. Cloud chambers provide a visual means of observing evidence of ionizing radiation; even cosmic rays! An ionizing particle or electromagnetic ray leaves a momentary trail of condensed vapor in its path. 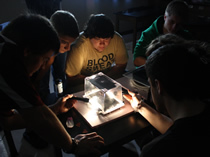 Physics and Astronomy Outreach recently made sets of cloud chambers available to high school STEM teachers participating in both the Science Express and QuarkNet programs at Purdue. 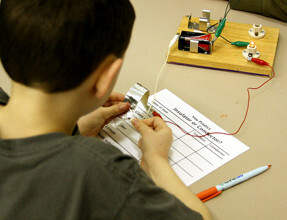 With two semesters of designing, testing and trial collection of data, service learning student and future teacher, Joe Kellenberger delivered the lesson he created, based on a scenario in which space explorers must devise an electromagnet strong enough to retrieve the metal key to initiate ignition. Students learned about the ability of some materials to retain magnetic behavior and created a hysteresis curve from their own data. causing interference among light waves. 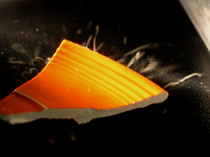 Engineered "nano" sand is repels water, but attracts oil. 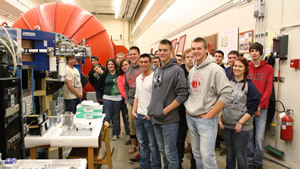 Outreach hosted Physics students from Lewis Cass High School for a visit to two Purdue research laboratories, PRIME Lab and the Purdue-1 reactor (PUR-1). PRIME Lab (Purdue Radionuclide Measurement Laboratory) is a particle accelerator and mass spec facility whose primary function is the measurement of nuclides and rare trace elements - this kinds of isotopes produces, for example, by cosmic rays striking the Earth. 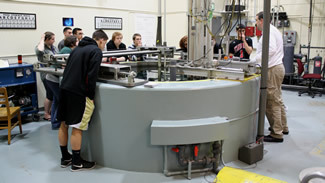 PUR-1 is Purdue's nuclear reactor; the only nuclear reactor facility operating in the State of Indiana. Students learned about various types of radiation, and how activated nuclei can be created and analyzed in elemental research. They then got an up close and personal tour of the reactor itself! "The visit to Purdue was something that I will never forget. Learning about particles in a way where I can actually see how scientists got their conclusions instead of just listening to a teacher talk about it really helped me understand. The experience was amazing." "The tour taught me a lot about the science of atoms, radiation, nuclear reactors, and the particle accelerator. The Alpha Gamma guy made an impact on my career thoughts and view of science. His explanation of how related radiation is to so many things expanded my thoughts of going into a science major." Physics and Physics Education service learning students prepared inquiry-based activities for elementary students for Saturday science clubs. 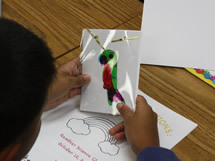 Among the concepts that students explored were properties of color and light, heat and temperature, and forces. Students learned how combinations of colors can be used to create other colors. 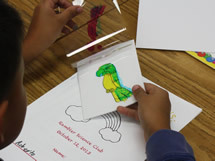 Elementary students learn that surface area and volume change at different rates with changes in size - a fundamental concept related to nanoscale materials and phenomena. Investigating a real life aspect of surface to amount of material (volume), students conducted a series of experiments on rates of dissolving. 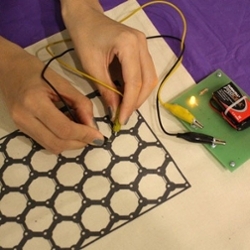 This nano-based lesson provides students opportunities to utilize a number of mathematics standards, among them area, volume, time, linear measurements, constructing and using ratios and graphing. See photos. Among the favorites that made it big were two investigations involving electric circuits. 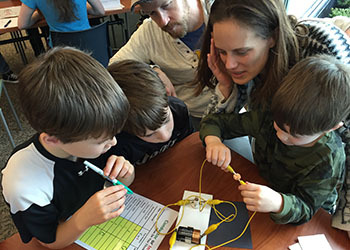 The scouts learned about the components of circuits, and then made and tested their predictions about the kinds of materials that act as conductors and insulators. At the conclusion of the event, senior physics student Aaron Zimmerman held a Q and A with the boys to hear about what they had learned. 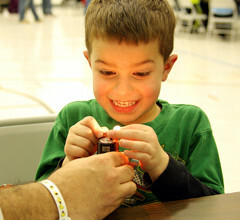 See more about this story, including a video of some of the activities, on the Purdue College of Science website.